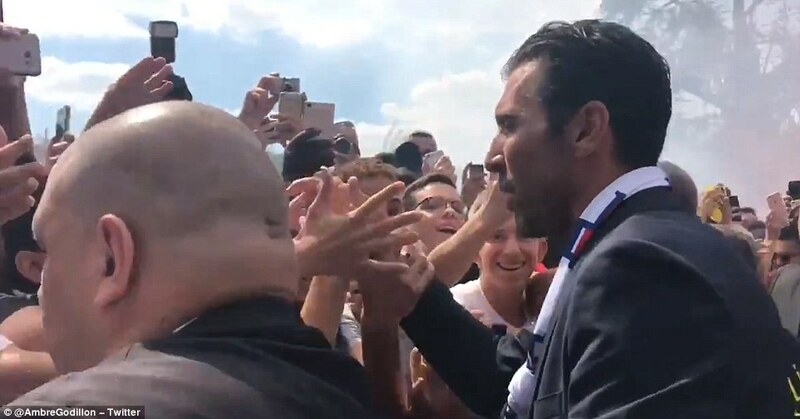 Gianluigi Buffon announced his arrival at Paris Saint-Germain in typical style as he was officially unveiled at Parc des Princes on Monday afternoon. The 40-year-old goalkeeper hung out of the window of his Renault and swung a club scarf as he was driven through the streets of Paris to his first press conference as a PSG player. A procession of mopeds followed behind bearing Italy flags while several let off flares to celebrate the arrival of one of the game’s biggest players. Hundreds of fans lined the streets in the hope of getting a glimpse of the living legend, who brought an end to his long association with Juventus after his contract expired this summer. 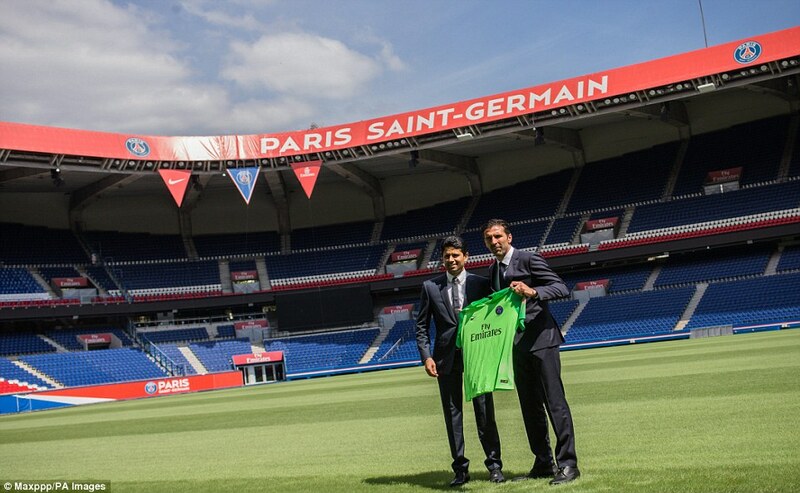 Buffon soon found himself on the Parc des Princes pitch, where the club’s Qatari president Nasser Al-Khelaifi was waiting to hand him his new shirt and pose for pictures in the summer sunshine. He then invited his two sons, David and Louis, and partner Ilaria D’Amico onto the pitch for a family snap. Then, it was time to face the French media for the first time and there were plenty of questions to answer with the most pressing being whether he expects to be first-choice under new manager Thomas Tuchel. Alphonse Areola was impressive in goal for PSG last season as they secured another Ligue 1 title and won’t let his No 1 spot go without a fight. That, it appears, is exactly what Buffon is expecting. The 2006 World Cup winner says he was not guaranteed the No 1 spot by PSG during negotiations and says he has always ‘earned’ the right to be first-choice at every club he has ever played for. Having been confirmed a PSG player last week, it has been widely theorised that the player and the club found common ground in their efforts to win the Champions League. For PSG’s Qatari owners, winning Europe’s biggest tournament has been the objective from day one while it has somehow eluded Buffon throughout his illustrious career. However, Buffon says it would have been ‘madness’ to join the club on that basis alone. Buffon was expected to hang up his gloves after leaving Juventus while a move to Major League Soccer was also mooted. A move to another top European club was not expected and Buffon admits even he was surprised to hear from them when they first made contact, but now believes he can play on even longer than his 12-month contract. ‘It was a surprise,’ he said when asked about the first time PSG made their move in May. ‘I was thinking of a different sort of future. Following the press conference, the hundreds of fanatical supporters waiting outside were rewarded for their dedication as Buffon emerged from the stadium to greet them. They chanted his name as he walked along the line shaking hands with those at the front and even held a flair to compose the crowd in song.